Growing in damp ditches throughout Europe and western Asia, meadowsweet takes its name from is original use of flavouring mead, or honey wine. Today it is highly regarded as an antacid herb, helping both to combat excess stomach acid leading to indigestion and gastritis and to reduce the body’s acidity generally, so helping with arthritic conditions. The honeyed aroma of the meadowsweet flower lifts the spirits and clears the head. The flowers can be used in brewing wine or beer. The herb is an excellent "herbal aspirin" due to the pain-relieving and anti-inflammatory activities of the salicylates against headaches or muscular pain, colds and flu. If taken very hot, the tea will help sweat out fevers, chills and colds. 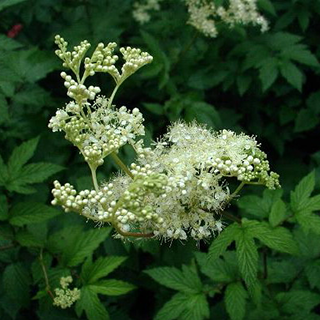 Meadowsweet is also a valuable astringent, being particularly useful for treating infant diarrhoea. Drink 1 cup (1–2 tsp herb per cup boiling water) of leaves and flowers 3 times daily for feverish colds or mild rheumatic pains. Drink 1/2 cup every 2 hours for acid reflux or indigestion. Can be given to children for stomach upsets; consult a herbalist for advice on dosage. Take 40 drops–1 tsp (2–5ml) 3 times daily for gastritis, gastric ulceration, or chronic rheumatism. Combine with angelica, bogbean (Menyanthes trifoliata), or willow for arthritis. Soak a pad in dilute tincture and apply to painful arthritic joints or for rheumatism or neuralgia. Prefers fertile, non-acid, moist-toboggy soil in a sunny or lightly shaded position. Sow seeds in autumn in a cold frame and transplant the following spring when the seedlings are established. Allow 24in (60cm) between plants. Alternatively, propagate by division in autumn or spring, or by root cuttings in winter. Collect in summer just before, or at, flowering.